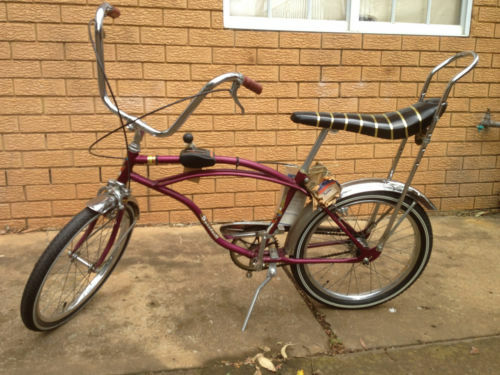 Growing up in Taree from about 1967-72 I was the proud owner of a purple dragster bicycle. High-rise handle-bars, a T-bar gear shifter midway along the top-tube (in hindsight, perilously located), and banana seat with sissy bar meant I was the height of late-60s, early-70s bike-riding fashion… something that escaped me as a nine or ten-year-old. I can still recall riding around Nicoll Cres with my friends singing Bopping the Blues (Blackfeather, 1972 – not that I actually knew who the band was at the time) or pedalling down to the corner store for a 15c can of soft drink. Saxby’s I think. I can also recall my mother giving me a sheet of flouro pink stickers that had Christian mottos or sayings on them for the purpose of encouraging people to think about God. When I started riding the bike to school, we attached a bike rack at the back (I’m finding this hard to imagine but I know it’s true because my school case once fell off it in the middle of the road outside Taree West Primary School and while scooping my belongings back in, I found about 15 cigarettes lying there and scooped them in too – but that’s another story). Anyway, we used to park our bikes in racks at the side of the school and I can distinctly remember two boys, walking past as I was preparing to leave for the day, stopping, reading the sticker, laughing and moving on. The good news was that they appreciated the humour of the flouro pink sticker and this saved me from a moment of ridicule which I had been fully expecting. Now, in 2012, this is an extremely old line which still gets trotted out. But in the late 60s, early 70s – it was brand new. And the saying has remained associated with these memories ever since. Of my purple dragster, of my mother’s eager new faith and desire to share it with others, of my own childlike faith and an innocence in putting my beliefs on the line, of wearing green button-up shirts to school, drinking warm flavoured milk in small foil-lidded bottles at recess and falling off the monkey bars and smashing my head open one lunchtime (yet another story). Forty years on and recently I have paused to reflect on the whole idea of our relative location to God and the reality of him feeling far away. The past few years have seen some changes in my life that I could never have anticipated, to do with who I thought I was and what I was doing with my life. A lot of movement occurred, often outside my control, but thankfully the most important things of life – faith, marriage, family, health – have remained true and near. God has indeed seemed distant, often, and yes, it was me who moved in those times. But if God seems far away to you today, he isn’t. He’s close enough to whisper in your ear and know the longings of your heart.